The basic characteristics of Japanese cooking were determined by the types of food available, which included fish and other seafood in particular, as confirmed by remains found in Jomon (縄文 じょうもんca 10,000 BC−ca 3000 BC)-period archaeological sites. This protein source was later supplemented by rice, for which the climate and soil of Japan are eminently suited. From then on, Japanese cooking evolved around rice, while other foods were consumed as side dishes. This pattern, firmly established early in the dietary life of Japan, is still prevalent today. 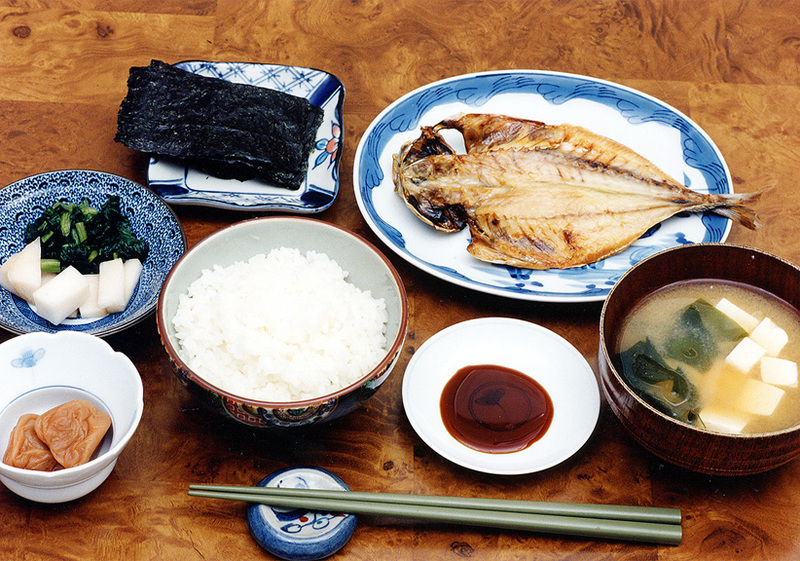 At the core of so-called Japanese food are things like rice, miso soup (misoshiru 味噌汁 みそしる), grilled fish, simmered vegetables (nimono), and pickled vegetables (tsukemono). The five main seasonings that distinguish Japanese cooking are shoyu (醤油 しょうゆ), sake (酒 さけ rice wine ), sugar, mirin(みりん sweet cooking sake), and miso.